The Indie Fantasy Bundle Is Live! 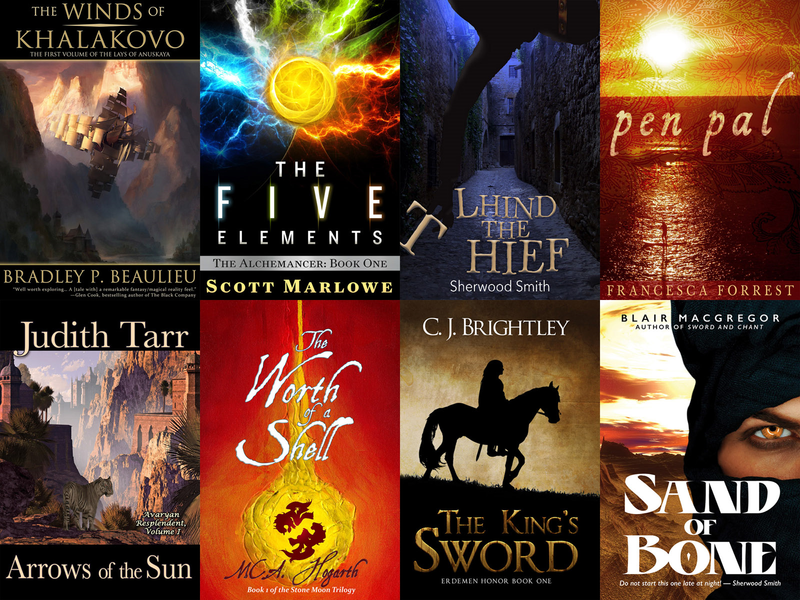 A couple years ago, StoryBundle included my first novel in the Indie Fantasy Bundle. This time, StoryBundle offered me the opportunity to curate a bundle of my own, and I jumped to accept. I couldn’t pass up the chance to share some of my own favorite writers with you. This Indie Fantasy Bundle includes some names you’ll recognize, and some that might be new. The novels give fantasy readers who love the genre a diverse feast of great reads: epics where the fate of dynasties depend on the strength of a few dedicated men and women, adventure tales that never slow down, gods who intervene on behalf of their chosen servants, cultures in upheaval when its people dare to question ancient boundaries, political intrigues fueled by magic, and characters young and old who face challenges of faith, honor, and survival. It includes a World Fantasy award winner, Gemmell and Spectrum award finalists, Nebula finalists, and Writers of the Future award winners. The bundle includes Bradley Beaulieu’s epic debut novel The Winds of Khalakovo, where dynasties and personal desires collide in secret chambers below and the wind-filled skies above, and Scott Marlowe’s action-packed The Five Elements, filled with adventure and alchemy and powerful elemental magic. You’ll meet a talented and clever outlaw in Sherwood Smith’s Lhind the Thief, a soldier who must rediscover his own purpose in C.J. Brightley’s The King’s Sword, and an alien race facing challenges and discoveries that could destroy their society in M.C.A. Hogarth’s The Worth of A Shell. Francesca Forrest’s Pen Pal joins a child watched over by the spirits of the ocean with a woman who discovers the awakening power of the earth’s fire. Judith Tarr’s Arrows of the Sun sets an empire a mere century old on the brink of breaking apart. My own dark fantasy Sand of Bone casts one outcast ruler into the wilds to discover the desert’s magic before her kin hunts her down. StoryBundle lets you choose your own price, so you decide how much you’d like to support the writers. For $3—or more, if you’d like—you’ll receive the basic bundle of four novels in DRM-free ebook format. For the bonus price of at least $12 or more, you’ll receive all eight novels. If you choose, a portion of your payment will go toward supporting different charities such as Mighty Writers and Girls Write Now. Over the years, StoryBundle and its participating writers have donated thousands to support awesome charities doing great work. The Indie Fantasy Bundle is available for only three weeks. It’s a great opportunity to pick up eight wonderful novels for winter reading, support independent writers who want to take you on an fantastic journey, and discover new writers with great stories along the way. Pay what you want (minimum $3): You decide how much these fantastic books are worth to you. If you can only spare a little, that’s fine! You’ll still get access to a batch of exceptional titles. Receive extra books: If you beat our bonus price, you’re getting eight total books! To be the first to hear all about the next StoryBundle I’ll be curating, upcoming titles and sales, and answers to all your questions, take a second to sign up for my not-too-often newsletter!